Kashi is a senior-level teacher of TriYoga International, has studied with Kali Ray, the founder of TriYoga since 1991 and is on the TriYoga teacher-training staff. Her lifelong exploration of movement, breath and spirit has strongly influenced her teaching style. Kashi has introduced and inspired many students in the flow of TriYoga who have since gone on to open their own yoga centers from Philadelphia, Pennsylvania to Northern California to South Africa! She is grateful for this comprehensive and complete method of yoga to higher awareness and the Divine Inspiration and Unconditional Love of Yogini Kaliji. In her classes, Kashi creates a safe and joyful environment for students to enter deeply into the inner flow while giving clear and precise guidance for the correct alignments and the gentle spinal wavelike movements unique to TriYoga. The devotion, dedication and compassion that she brings to her teaching, reflect her many years of study with her Guru, yoga master, Kali Ray. Kashi has over 23 years experience in teaching group classes, private and semi-private sessions, corporate classes, children, teens, monthly workshops, retreats and teacher training. 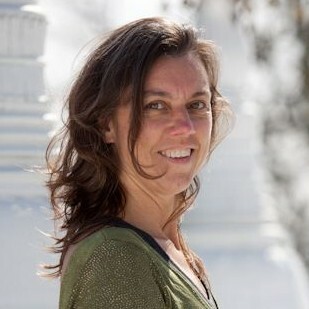 Kashi is the owner/director of Devi Yoga Center in Sebastopol, California.